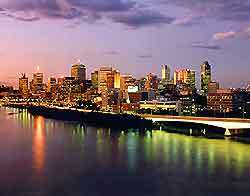 Brisbane is situated on the south-east of Queensland, Australia, and is one of most popular holiday destinations in the entire country, being Australia's third-biggest city. 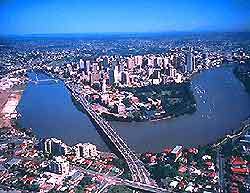 This stylish and vibrant city has evolved around the large River Brisbane, which meanders through the centre, often attracting large black whaler and bull sharks. 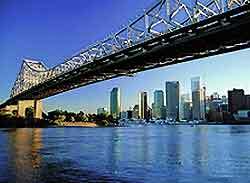 Over the years, many bridges have been built to connect North Brisbane to South Brisbane, and the Story Bridge is one of the most famous, with its magnificent architecture becoming an important part of city life. With hot summers and pleasant winters, exceptional weather and a laid-back holiday atmosphere, the city now attracts people from all over the world, who come here to sunbathe on the beaches lining the Golf and Sunshine coasts, and to explore the islands residing in Moreton Bay. The Queens Street Mall is where the Brisbane Tourism visitors centre is located and this should always be your first port of call for tourist information. Nearby and just across the river is the South Bank visitors centre, which is a convenient information point for those based within the city's South Bank Parklands area. Many hotels are concentrated around the city centre, Spring Hill - to the north of the city centre, Petrie Terrace - on the western side, Fortitude Valley and New Farm - to the north-east, and the West End District in the southerly suburbs. Other accommodation is available on the outskirts of Brisbane, in scenic areas such as the South Bank, Paddington and Milton, and also in nearby areas, such as Moreton Bay, Manly, North Stradbroke Island, St. Helena Island, Coochiemudlo Island and Queensland's legendary Gold Coast, where you will find many stylish, boutique-style hotels and guest houses. These are often more reasonably priced during the week and booking in advance is advisable. Brisbane and the surrounding area features some of the world's most stunning, golden, sandy beaches with uninterrupted coastlines and world-class surfing conditions. 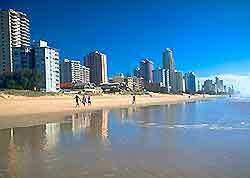 To the north, the famous Sunshine Coast runs for more than 70 km / 44 miles from the top of Bribie Island to the north of Noosa, and to the south, the Gold Coast stretches 35 km / 22 miles between Surfers' Paradise and the New South Wales (NSW) border. Some of the most popular tourist attractions in Brisbane include the Conrad Treasury Casino - full of numerous roulette and blackjack tables and fruit machines; the Powerhouse - regularly hosting many of the city's most important events and concerts; the Brisbane Planetarium - providing incredible views of the sky at night; the Australia Zoo - with many ferocious crocodiles, founded by world-famous Aussie crocodile hunter, Steve Erwin; the Alma Park Zoo - where you are able to get hands-on with friendly koalas; the Brisbane Botanical Gardens - home to many important collections of tropical plants from around the world; the Mount Coot-tha Botanic Gardens - including a magnificent Japanese garden; the South Bank area - featuring a landscaped riverside park with streams, canals, man-made lagoon and beach; and humpback whale watching - in Moreton Bay, Whitsunday, off the Redcliffe Peninsula and Hervey Bay, between mid-June and early November. Other impressive landmarks worth visiting include the Story Bridge - built in the late 1930s to cross the wide Brisbane River and considered a tremendous feat of engineering; Anzac Square - a large central square with monuments to those who died in combat; Brisbane City Hall - a fine example of classical Victorian Architecture built in the mid-19th century; Parliament House - with a breathtaking exterior and an elaborate interior; Customs House - featuring outstanding architecture and a huge central dome; St. Stephen's Cathedral - built during the 1860s, with outstanding neo-Gothic style architecture; and the University of Queensland - founded in 1909 and now home to more than 30,000 students each year. 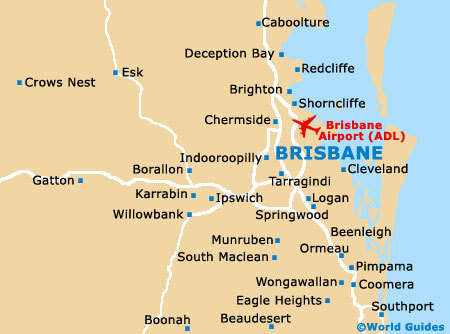 More information about Brisbane Tourist Attractions and Brisbane Landmarks. Brisbane also has a number of top museums, providing in-depth Queensland information and artefacts. Some of the most visited include the Anthropology Museum - part of the University of Queensland complex in western Brisbane; the Queensland Museum - one of the biggest museums in the city, with a large natural history section; the Queensland Maritime Museum - celebrating the state's rich maritime and nautical heritage; the Abbey Museum of Art and Archaeology - housing a diverse collection of historic items from around the world, dating back thousands of years; the Institute of Modern Art (IMA) - with contemporary paintings, sculptures, ceramics and glasswork; and the Queensland Art Gallery - featuring a diverse collection of modern and classical paintings and authentic Aboriginal art. Brisbane is also famous for its large number of superb and historic vineyards, wineries and breweries, which are particularly concentrated in the Stanthorpe district, Ballandean region and the scenic Canungra Valley. Wine tasting at vineyards and breweries in and around Brisbane is usually widely available. Many of these wineries often offer courses about general wine appreciation and tasting. The sprawling city of Brisbane has a friendly and welcoming atmosphere, with plenty of interesting features, huge shopping centres, superb restaurants, stunning weather, glorious sandy beaches and a major airport nearby, and is also within reach of the spectacular Great Barrier Reef. Architecture throughout Brisbane is varied, with a number of impressive, historic buildings dating back to the early 19th century, combined with some modern, striking skyscrapers. This combination of old and new makes the city's skyline breathtaking, particularly at night, when the lights on the tallest buildings are reflected in the water.